A decade-long mining boom has left a string of complications–environmental liabilities, social polarization and loss of governmental legitimacy. Meanwhile it has not resolved a single underlying problem. “It’s not an accident,” members of the Mining Victims Movement (Movimiento de Afectados por la Minería, MAM) declared immediately following the Nov. 5 dam rupture that unleashed a river of contaminated sludge in Mina Gerais. The spill destroyed villages, left more than 20 dead or missing and affected thousands more. “The corporations are completely responsible for this,” says Mario Zonta. Zonta noted that the companies do not monitor the reservoirs where they store toxic wastes, like the ones that broke this month. The social and environmental tragedy was caused by the Samarco mine in Minas Gerais State, Brazil. Two dams in the open-pit iron mine broke, and the sludge buried the village of Bento Rodrigues (just over 20 kilometers from the city of Mariana and 120 from state capital Belo Horizonte), where 600 people lived. Samarco is owned by Vale and BHP Billiton. The 500 people rescued by firefighters after being trapped in toxic sludge should have been put through a decontamination process after suffering direct exposure to toxic substances. “The accidents and impacts of mining companies are permanent, and the companies continue with the same arrogant posture, talking about social and environmental responsibility,” a statement from dozens of social organizations reads. “Vale has been in Minas Gerais for 70 years,” Zonta states.. “There is enough experience to prevent this kind of event, so we hold them responsible for the deaths and disappearances” (Brasil de Fato, November 6, 2015). A soil analysis 300 kilometers away from the dams revealed incredible concentrations of iron, manganese, and aluminum– thousands of times higher than normal concentrations (R7 Noticias, November 11, 2015). According to toxicologists, the most dangerous metal is manganese. It can cause muscle disorders and bone and intestinal problems and aggravate heart problems. At first, the company stated the spillage was only sand, but when asked in sight of the official analyses it did not respond. It clung to talk of “mud not containing wastes toxic to humans, only inert material composed of sand” (R7 Noticias, Nov. 11, 2015). However, due to the high levels of contamination detected, water treatment was suspended in nine cities, affecting 800,000 people and the prefecture declared a public disaster situation. MAM cites the underlying problem that mining companies themselves are responsible for the studies that monitor the situation of the mines. “They hire the companies to conduct environmental impact studies for submission to the Ministry of Environment,” Zonta pointed out in a recent interview with Brasil de Fato. The result, according to MAM, is a lack of control in mining policy and extraction rates, waste storage, and mineral transfer, since all enforcement and supervision is left to the companies themselves. 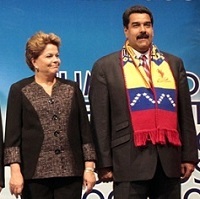 On the same day of the Mariana tragedy, the Brazilian Mining Forum was held in Belo Horizonte. Businesspeople celebrated the factthat Brazil is among the six largest mining countries in the world, and that in the coming years the mining sector will receive the largest investments of the the national economy than any other sector (about $53 billion until 2018). They called to “increase the legal security of investors”(Brasil de Fato, Nov.7, 2015). Minas Gerais’ Secretary of Economic Development Altamir Roso said the Samarco mine was “a victim of the rupture” of the dams. He went further still than the entrepreneurs, “I say with confidence thatthere is too much rigidity in the process of granting permits and also too many agencies involved.” His proposal is that supervision and monitoring need not be the role of the state, which may delegate it to others. The International Organization of Victims of the Vale issued a statement saying that what happened in Mariana is “crime,” rejecting that it was an accident. Environmentalists complained that the majority of the 31 deputies on the commission to discuss the new Mining Code in the Chamber of Deputies had their 2014 election campaigns financed by mining companies. Gustavo Gazzinelli of the National Civil Society Forum on Watershed Committees believes the Mariana disaster “will resurrect something similar to what happened in 2013,” when millions of people took to the streets protesting the increase in public transport fees, known as the Days of June. The scandal is enormous because the dam that broke was said to be among the safest, owned by a company that has won several awards for sustainability and presents itself as defender of the environment. In mining, accidents are the norm. On September 12 there was a spill of 1.5 million liters of water contaminated with cyanide in the Veladero gold mine in the province of San Juan (Argentina). 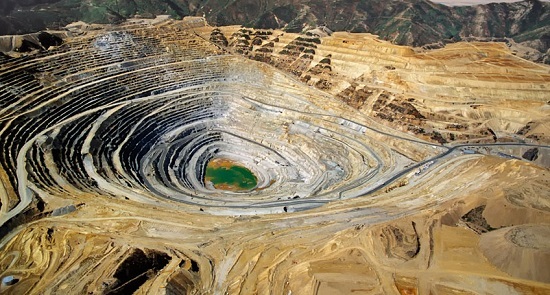 The accident put Barrick Gold, the company that owns the mine, in a sticky situation. An investigation into the company demanded an immediate solution to the problem or else that the company “stop incorporating cyanide in the leaching process until anomalies disappear” (EFE and AFP, Nov. 11, 2015). One of the consequences of the spill was the resignation of Barrick Gold’s chief executive in Argentina. The spill was caused by a failure in a pipeline for transporting cyanide solution, but it shows that companies have no contingency plans when such situations occur. The people of Jáchal decided to block access to the Veladero mine. Many decided to join the actions in the face of the seriousness of what had happened. Several weeks after the spill, the Universidad Tecnológica Nacional and the universities of Cuyo and San Juan disseminated reports on the “presence of heavy metals in the water” and “the existence of cyanide in various water samples” (Lavaca, Oct. 23, 2015). Police detained 23 protesters, but those responsible for the disaster have yet to be processed. By claiming that the spill was an unavoidable accident and not an instance of corporate irresponsibility the company has sought to reinforce the impression that no one is responsible for the problems generated by mining, and that no one should be brought to justice. The increase of so-called accidents is due to the exponential growth of mining operations. A recent study on Peru asserts that, in this country with a mining tradition, between 1992 and 2014 “the number of mining grants increased eightfold, while the area used by mining did so by eleven” between 1992 and 2014. In the Moquegua region, 71% of land is occupied by mining concessions. The regions of Apurimac, La Libertad, Ancash, Lima, and Tacna follow with 55 to 67%. Other mining regions hover around 50% of territory occupied by mining. Extraction intensity has grown thanks to new technologies and, most notably, by modalities of open-pit work, with the destruction of entire mountains by explosives and heavy machinery. According to the Statistical Yearbook of Mexican Mining, 2013 (prepared by the Geological Survey), mining companies extracted 774 tons of gold in the last ten years. This figure compares to the 190 tons mined during three centuries of colonialism. According the Mexican newspaper La Jornada (Nov. 9, 2015), “in ten years, mining companies extracted four times more gold than in three centuries.” That brutal intensification of extraction rates causes huge profits alongside tremendous damage to the environment and people. “Accidents” are, therefore, part of the mining business. The debate on mining has highlighted the environmental and social problems it creates. Social movements, governments, universities, and environmental NGOs have focused on these issues. In the case of Peru, mining revenues to the state have increased considerably: 800 million soles in 2003 to a peak of 11.28 billion in 2011, which then dropped to 6 billion in 2014. These contributions came to constitute 23% of central government revenue in the 2006-2011 period of high prices. The governments of the mining regions financed a substantial part of their work from taxes on mining, which represented up to 53% of the investment budget. But the state’s dependence on mining revenues generated two serious problems. The first was first detected when mineral prices fell, and is reflected in the drastic reduction of investment. 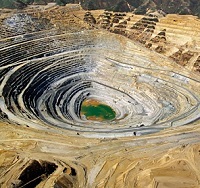 In 2010 Peru’s regional governments financed a quarter of their budgets with mining taxes and mining royalties; in 2014 that proportion had fallen to 10%. As for investments, in 2010 half were financed with through taxes and royalties, which dropped to 22% in 2014. Extractivism does not generate productive chains and employs very few workers. The Peruvian government has vowed to reduce dependence modify by opening up new areas, according to the National Productive Diversification Plan of 2014. However, this plan “has little support from the national government,” and commercial and state actors “aim to continue the current extractive model.” Extractive income seems to be addictive, perhaps because it facilitates easy earnings, for both governments and the populations. But there is a second factor, not usually visible. “Since the revenue is distributed only among regions where mining takes place, a deep inequality in the national distribution of investment resources is generated.” Furthermore, in each region the distribution of resources favors the provinces and districts where mining activity is carried out, so inequality deepens. This is an evaluation by an organization that does not reject mining outright. If these are the conclusions of the period in which mining exports grew the most and more states benefited from mining, the outlook for the future is of great concern. After the boom, environmental and social problems have deepened, states and institutions have lost some of their legitimacy, and underlying problems have not been resolved. Mining was bad business. Grupo Propuesta Ciudadana, “Al final de una década de boom, ¿Qué le dejó la minería al Perú?”, Lima, noviembre de 2015, p. 14. Grupo Propuesta Ciudadana, “Vigilancia de las industrias extractivas. Reporte Nacional N° 19”, julio de 2015, p. 16. “Que le dejó la minería al Perú?”, ob cit p. 5. Los citados informes fueron realizados con apoyo de USAID, entre otros.